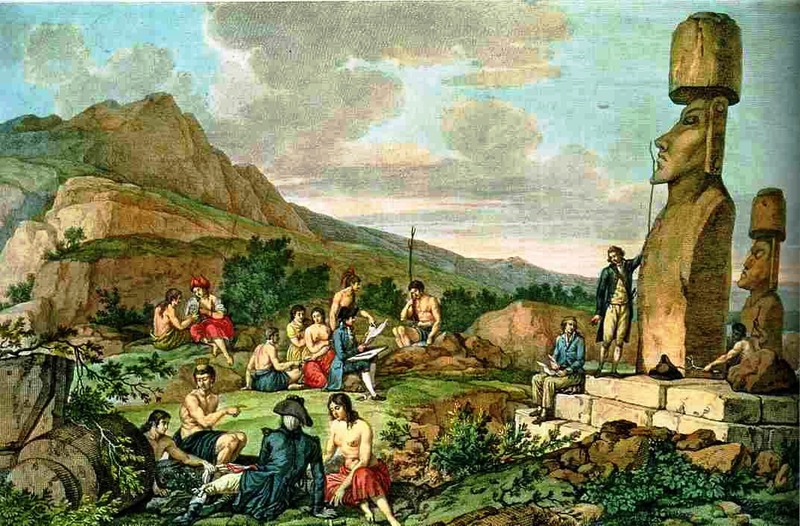 Four expeditions led by Europeans visited Easter Island during the course of the 18th century. The Dutch expedition led by Jacob Roggeveen revealed, in 1722, the existence of this isolated land in the South Pacific, its discovery on Easter Sunday giving rise to its name. In 1770, the Spanish sent a surveying expedition from Callao in Peru to this island which they considered to be in their zone of influence, although it lies almost 4,000 km from the coast of Chili. Led by Don Felipe Gonzalez y Haedo and composed of two ships, the San Lorenzo and the frigate Santa Rosalia, the expedition anchored on the northern side of the island on the 16th November in a bay immediately baptized ‘Gonzalez y Haedo’. Five busy days allowed a reconnaissance by two launches of the coast of the whole island, an exploratory foray into the interior, the taking of possession of the island in the name of the King of Spain (it was then baptized ‘San Carlos’[ Carlos III, son of Philip V, was the then King of Spain]) which was marked by ‘the signature’ of local chiefs of an ‘official’ deed, and by the erection of three crosses on three hills on the north east of the island on the slopes of Poike [this is an extinct volcano on the eastern tip of the island which is 370 metres high and is the second highest peak on the island]. One of the important results of this expedition was the production of the first map of the island, accompanied by a chart of the bay and a panorama of the land seen from the anchorage. The pilots Hervé, of the San Lorenzo, and Aguera, of the Santa Rosalia, are the likely authors. Dr Francisco Mellén Blanco, in his work Manuscritos y documentos españoles para la historia de la isla de Pascua published in 1986, and completed by an article which appeared in 1991 in issue No 1 of the Revista española del Pacifico, has a list of all the known copies of this map and the accompanying commentaries. These various copies are rather similar. The representation of the land surface only concerns the position of the three crosses and the Rano Raraku volcano. A certain number of place names appear in the legend, among which are ‘la punta de San Juan’ and ‘la punta de Santa Rosalia’. Superimposing the Spanish map over the current one shows great accuracy of the outline, especially when one considers that this expedition did not have the scientific capabilities that the two following ones did. In March 1774, during his second expedition, James Cook, having just left the cold waters of the Antarctic where the search for the hypothetical South Land had taken him, resumed his northerly course and stopped at Easter Island. He thought that he could find fresh supplies there but noted bitterly ‘that there was no safe anchorage, nor fresh water worth carrying on board’ and affirms ‘that nature showed itself very sparing in its gifts to this island’. The ships moored in Hanga Roa Bay. Numerous observations allowed Cook to give us a ‘description’ of the island. Was James Cook aware of the Spanish expedition? He himself wrote: ‘before my departure from England, I had learned that a Spanish ship had, in 1772 [note the mistaken date] visited the island where we found ourselves’. We should not be surprised at this lack of precision, the Spaniards being very sparing in passing on information about their maritime knowledge. A map was produced. Unlike the Spanish map, the land surface is shown by shaded lines. Comparison between this map and the current one shows a rather correct representation except for the Poike peninsula situated on the north-east of the island. The remarkable circular crater of Rano Kau [a 324-metre high extinct volcano] situated in the south was probably not observed. Departing Brest on 1st August 1785, the expedition led by Lapérouse, after stopping at the Chilean port of Concepcion, put into Easter Island as recommended in the King’s Instructions. La Boussole and L’Astrolabe reached the island at its north-east tip, sailed along the east coast, rounding the southern tip of the island to anchor in Cook’s Bay in April 1786. The stay was of very short duration but the quality and quantity of information gained are quite remarkable. A map was drawn up: it appears in the Lapérouse Atlas, accompanied by a very detailed chart of Cook’s Bay. The land surface is indicated in a rather precise fashion by ‘molehills’, except for the northern part. Examination of this map suggests a certain number of questions. How, in such a short time, could such a map, whose accuracy compared with the current map is remarkable, have been drawn up? Why this ‘blank’ in the northern part? Among the place names appearing on the map are those of ‘Bay of the Spaniards’, ‘pointe Saint Jean’, ‘pointe Saint Rosalie’. These observations are evidence that Lapérouse had knowledge of the Spanish map. F. Mellén Blanco reports that Catherine Orliac had listed ten copies of the Spanish map of San Carlos Island (Easter Island) in the Department of Maps and Charts of the Bibliothèque Nationale [National Library] in Paris. This can be easily explained, in spite of the slowness of the Spanish in communicating their maritime knowledge, when one knows that at this period relations between France and Spain were particularly friendly. ‘Lapérouse, excellent sailor, had the professional ethic of respecting, on his map, several Spanish place names’, wrote F. Mellén Blanco . One can consider that the Spanish map had been used to show the north coast which was not sailed along by the expedition. If the general outline is a little more precise than that of the Spanish map, its merit probably comes from the better quality of measurements carried out with perfected instruments, such as the quadrant, but also to the quality and skill of the expedition’s scientists. Curiously, on the majority of maps, the Bay of the Spaniards bears the name ‘Lapérouse Bay’. We have not managed to find out when and by whom this substitution was carried out. It certainly wishes to pay homage to the one who came ‘only to do good’ but there we see a flagrant injustice that the navigator from Albi would very certainly have disavowed. The foregoing is an article by Henri Colombié, which appeared in the ‘Journal de bord’, the magazine of the Members of the Association Lapérouse Albi-France, No 37. We are grateful to Monsieur Henry Féral, President, and Monsieur Henri Colombié, Editor, for their permission. Translation by Dr W Land AM.